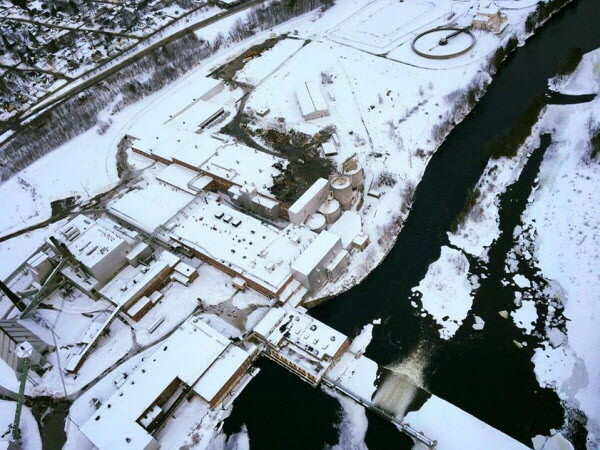 An aerial view of the former Great Northern Paper Co. LLC site, captured by a drone in late February. In a loan guarantee application to the U.S. Department of Energy, EMEP LLC described the East Millinocket project visually as a prism through which raw biomass would turn into various shades of revenue. PORTLAND, Maine — The company hoping to buy the shuttered East Millinocket paper mill has big plans for generating electricity and fuel from Maine wood waste — $240 million in plans, to be exact. The first step in that biomass effort — purchasing two biomass plants in West Enfield and Jonesboro — hinged on government subsidies. Documents filed on Tuesday with a lawsuit seeking to halt demolition at the mill indicate that EMEP LLC’s next step in East Millinocket would too, in the form of a federal loan guarantee for biomass-to-fuel technology that’s not yet run at the commercial scale they envision. The company says that leg up from the government would eventually allow it to produce a high-value product that could turn biomass power plants now reliant on Maine taxpayer dollars into sustainable businesses. While completion of that plan remains years away, representatives for EMEP left court on Tuesday reiterating what they said in their lawsuit filed earlier that morning: they’re ready to offer $1.75 million for the East Millinocket property. The owner of Stored Solar, which operates two biomass plants in Maine, has partnered with Scott Gardner, who runs the trucking, logging and wood chip company W.T. Gardner and Sons, on the East Millinocket project. At the former paper mill site, they aim to turn biomass into liquid fuels that could be blended to make biodiesel, gasoline and jet fuel. The company said the technology, which comes from a Houston company, would allow it to use the byproduct of the fuel-making process to power biomass boilers. Those boilers, in turn, will heat the facility and dry incoming wood waste to prepare it for processing. It also plans to sell renewable electricity credits to Massachusetts and to sell waste heat to other on-site businesses. Those could include a greenhouse and a chopstick manufacturing facility, according to its application for a loan guarantee from the U.S. Department of Energy. 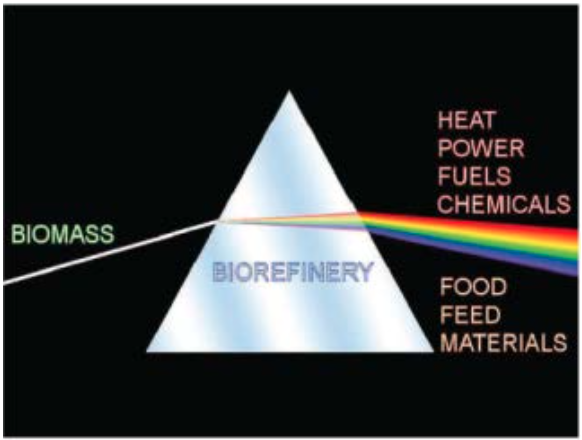 The company describes a combined system that would increase the efficiency of producing biomass, generate new revenue from byproducts such as waste heat and add a new high-value product to the mix. The company told a Portland judge that the East Millinocket biorefinery would be the centerpiece of their $240 million effort to buy, upgrade and operate up to five more biomass plants in Maine, adding to the two biomass plants Stored Solar purchased last year, in Jonesboro and West Enfield. The company got its first payment — $241,000 from a taxpayer fund — for running those plants in January. To get the biorefinery up and running, the company hopes to combine 30 percent equity investment with a loan guarantee from the U.S. Department of Energy to support the other 70 percent of the cost. The company says the East Millinocket plant would employ 102 people full time. EMEP has two owners, SAG Realty LLC and Capergy US. William Harrington and Fahim Samaha are behind Capergy and Scott Gardner owns SAG Realty, making up EMEP’s three principals, according to court records. Samaha is president of Capergy US, which holds a majority stake in EMEP. Through subsidiary Stored Solar LLC, the company also last year purchased Covanta’s shuttered biomass plants in West Enfield and Jonesboro, and restarted them in January. In its lawsuit, EMEP also identifies Maine’s Department of Economic and Community Development as a partner, though the specific nature of that partnership remained unclear Thursday. “Whatever state incentives and programs are utilized to attract new private investment and help businesses succeed, we view as a partnership,” Ray wrote in an email. In the company’s federal loan guarantee application, EMEP notes that “the biomass suppliers are equity participants which assures a long-term alignment of interest,” adding that it expects that the fund to support the project will include various Maine businesses with connection to the biomass industry. Samaha’s wife, Kimberly Samaha, is the CEO of Synthesis Venture Fund Partners, which late last year launched an effort called the Maine Born Global Challenge to help identify bio-based technologies that it could pair with its facilities. Reached by telephone Wednesday and citing advice from EMEP attorneys, Harrington declined to comment in more detail on the project. In an application for financing submitted to the U.S. Department of Energy, Stored Solar states that it hopes to begin commercial delivery of biofuel by 2020. But that hinged on acquiring the East Millinocket property earlier and having engineering plans together by this month. The delay prompted the lawsuit filed Wednesday against the current owner, North American Recovery Management, to limit demolition at the mill site and eventually work toward finishing a purchase and sale agreement with EMEP. The timeline estimates the project will take three-and-a-half years from the purchase of the land for the biorefinery to begin producing and delivering fuels. EMEP claims that it spent about $6 million to date on its biorefinery project and it has visited the site multiple times. But its biggest visible leap toward its plan so far came with the purchase of the Jonesboro and West Enfield biomass plants. The company has cited that investment both as a sign of experience in the industry and as a reason their plans in East Millinocket must come together. In announcing the Maine Born Global Challenge late last year, Synthesis noted that “sponsor owners already have revenue-producing energy plants in place” in Maine. The company restarted the plants that month. In the lawsuit filed Wednesday, the company raises concerns that delays in the purchase from North American Recovery Management could derail its application for a loan guarantee with the U.S. Department of Energy, though it leaves the door open to other types of financing. “Without DOE or similar financing, we cannot build the biorefinery which will put the entire Maine Biomass Plan in jeopardy,” Harrington wrote in court testimony. Meanwhile, North American Recovery Management told EMEP that they would open their ears to all offers on the property starting Wednesday.